We've all heard of books on tape and audio books. Sure! We've even listened to them, perhaps. But have you ever heard of a wordless audio book? Sounds pretty paradoxical doesn't it? Yeah, I agree. And just for that, you must try Yellow Umbrella. It is a very interesting Kane Miller publication and a little stint with happiness. Now a wordless book, to be a good wordless book, has to have strong illustration to back up the story and tell it effectively in the absence of a few 100 words. Author-Illustrator Jae Soo Liu, has achieved all that and more with simple watercolours. The concept of the book came to her many years ago, on a rainy day, when she was a teacher in a middle school and she watched students coming to the school carrying their umbrellas. There was a pretty array of colours in the umbrellas and underneath them, all the children looked like one, whether they were short or tall, fat or thin, boys or girls. It was a complete scene of unification and harmony, where the only thing that stood out was colour. The reds, blues, greens, pinks and the yellow of the umbrellas. So that pretty much gives you an brief idea of the book. From page to page, is depicted the scene of children walking to school on a rainy day, protected under the hood of their umbrellas. You are looking in on the scene from above, to a lone yellow umbrella on the first page. Pretty soon, blue joins yellow and together they walk along the rainy street, when they are joined by a bright orange one. The three of them reach the end of the street and come to a bridge when green comes by. The droplets of rain causing little ripples on the pond below the bridge, and the coloured reflections of the umbrellas in the water, all give you a silent pleasure. Pink joins in and they cross a park, filled with slides and swings, and a cobbled walkway. By the time they reach the fountain in the middle of the park, red has also joined the group. Together, they walk down the steps onto the road, and purple leads the way now. They reach the train tracks, and teal huddles close to the rest, as they wait for the train to cross. They cross the tracks and walk on the street once more, with tall buildings on either side. By this time, more umbrella holders of many more merry colours have joined in and together, they cross the busy street, while all the vehicles stop to let them pass. Turn to the next page, and you know they have entered the school grounds, for the paths now, are flanked by tall trees on either side. The merry play of colours from the umbrellas contrasts beautifully with the lush green of the trees, which have been made lusher by the rains. And soon, the scene shifts from the top view and we now stand behind the children, behind all the rows of brightly coloured umbrellas, and we can see the school building just yonder. We also see a row of little feet ensconced in rain boots and sloshing their way over the rain covered ground. On the very last page, you see all the umbrellas stacked neatly in a little holder, a little puddle of water forming on the ground. Well, that's the song. 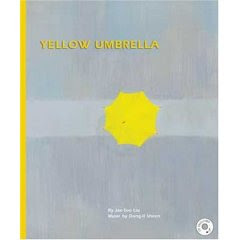 And Yellow Umbrella is the kind of book that can put a smile on your face and inspire you to be a little artistic. The sight of all those pretty colourful umbrellas on every page had me running to get out the crayons and paint some of my own and Winkie joined me in my little burst of artistry. 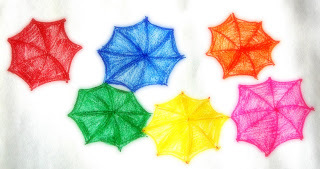 Obviously, we need a lot of practice to make them seem less like colourful cobwebs and more like umbrellas. So while I do that, why don't you go place a hold in your library! very nice back to back reviews - very interesting picks. I am getting goosebumps here reading about the book and the review. The girls loved it. Thanks for the suggestion T. Sushma...I am not sure if it is available in any direct bookstore there in Bangalore. The onmly option that I saw was for flipkart, and that too it seemed out of stock. If you are very interested in buying it, perhaps you could add your email there to be notified when stock comes in. Sorry, but hope this helps for now.